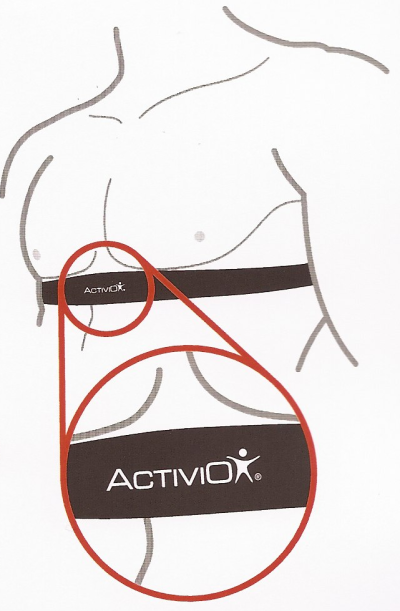 The heart rate chest belt is placed around the chest with direct contact against the skin, with the text side up and facing outward. In order for the measurement to be as good as possible, it is important that the chest belt is centred and that the two contact surfaces on the back side have solid contact with the skin. Take a chest belt and moisten the ribbed electrode surface. Use a few drops of water if needed. Attach the chest belt by using your elastic strap. Important that the chest belt sits tight and directly to the skin. 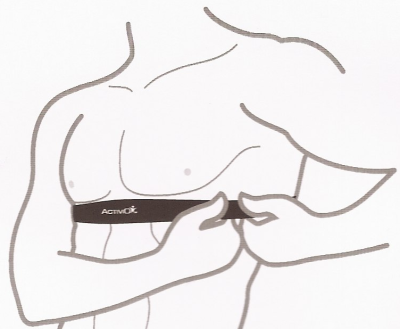 Women: Attach the chest belt underneath the bra strap. Make sure that the chest belt is correctly oriented. The Activio logo should be centered and facing out. Underwire bra is not recommended. The metal can cause interference. NOTE! Remove the chest belt carefully by unsnapping the strap. Improper handling can damage the bracket (end loops).